Status: The first column displays a green check if the index has been generated and is empty if the index has not been generated. The index exists in the Pix4Dmapper index database. For more information about the Pix4Dmapper index database list: Pix4Dmapper Index Database List. The index was created / edited by the user in this project. The index was created / edited by the user in another project (on the same computer) that was closed and saved. If the formula is valid. If the formula is incomplete or contains undefined band names. Edit: Enabled for user defined indices. Opens the Index Map pop-up allowing the user to edit the currently selected index formula. Duplicate: Duplicates the selected index with the name: selectedIndex_copy. The duplicated index will be user defined even if it is duplicating an index from the Pix4Dmapper index database. Add: Creates a new user defined index. Opens the Index Map pop-up to enter the new formula. By default, it adds it with the name: unnamed. If the name already exists, it will be created with the name: unnamed2. Remove: Enabled for user defined indices. Deletes the selected index. Important: User defined indices created for a project will be available for other projects on the same computer. 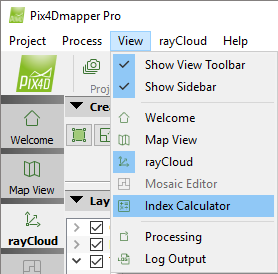 Select an Index: By clicking on a cell, the row will be selected and depending on the type of index (from the Pix4Dmapper database or user defined) some buttons will be available or grayed out (see above for more information). 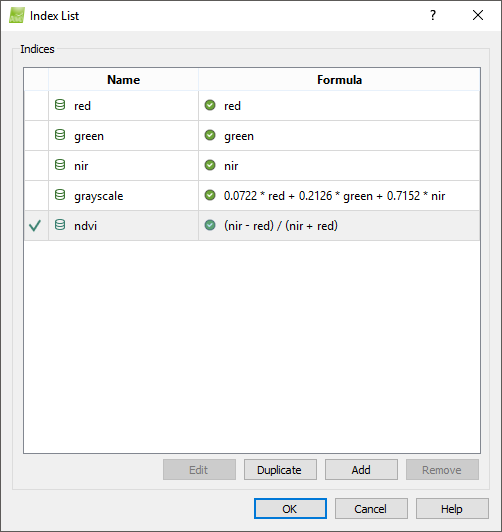 Edit Index name: Available only for user defined indices. Double click on a user defined index name and edit it. Edit Formula: Available only for user defined indices. Double click on a user defined formula expression and edit it. Important: The formulas expression is case sensitive: it distinguishes between upper and lower case. OK: Closes the Index List pop-up and the marked index is selected in the Name of the 3. Index Map section of the Index Calculator Sidebar. Cancel: Closes the Index List pop-up without selecting an index.